This piece was inspired by a summer working on a "dude ranch" near Yellowstone National Park. This piece was inspired by a summer spent working on a "dude ranch" just outside of Yellowstone National Park. On her day off, Renée would drive for hours exploring the Wild West. Scenic Red Lodge, Montana, became one of her favorite and most frequented destinations on these leisurely drives. During one of her trips, Renée noticed that the vast landscape was filled with her favorite colors as reflected in nature. These experiences out West were eye opening at this point in Renée's life. With their beauty came the artist's realization about how important wide-open spaces were to her, her art, and her personal well being. Love it each time I walk by it. The website does not do these prints justice. The print is beautiful and draws my eye each time I walk by it. 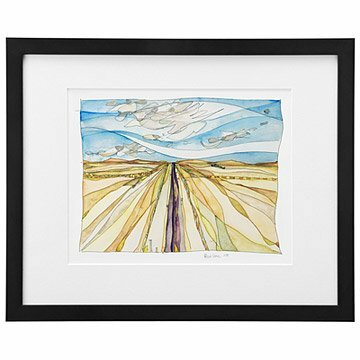 I purchased it because it reminds me of my great grandparents wheat farms in Montana, but once I saw it in person it really does have something so special about it - as if you can feel what being there would be like for a moment and not just a drawing. My husband and I like it so much, we are planning to by another of the artists prints. Beautiful subject matter, purchased three of series to go on problem wall. Impressionistic style evokes the beauty of the west in a colorful and delicate manner.